Measures the microwave emissions of any high-frequency device. 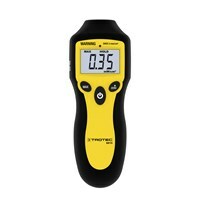 The radiation meter from the MultiMeasure Basic Series can quickly and easily locate harmful microwave radiation and their causes. Microwave radiation is odorless and invisible, but not without risk. The microwave oven in the household, various mobile networks, wireless video transmission systems, wireless network, bluetooth, for some radio transmitters, remote controls or cordless DECT phones can produce dangerous radiation, so these things should always be checked. The radiation meter BR15 is perfectly suited.